Amsterdam, c. 1765. A Dutch edition of Bellin's townplan of Nagasaki, engraved by Schley . Of interest is 'Desima', the Dutch Porcelain factory in the centre of the harbour. Brussels, 1827. 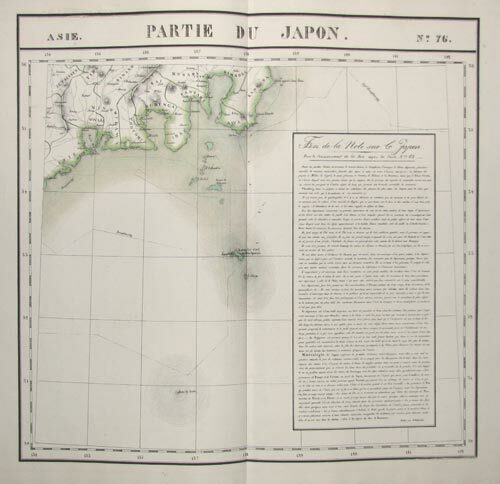 Honshu from just north of Tokyo to the Straits of Tsugaru, with two large texts in French describing the country. 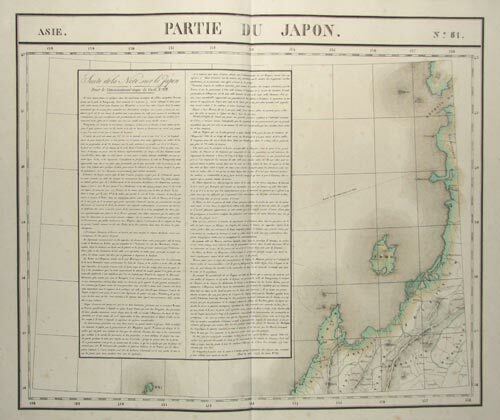 Marked on the right sheet is the route of Captain William Robert Broughton (1762-1821), who was sent to the North Pacific to join Vancouver and mapped the coasts of Japan and Korea in 1795. His was the first official encounter between a British ship and the Korean government. 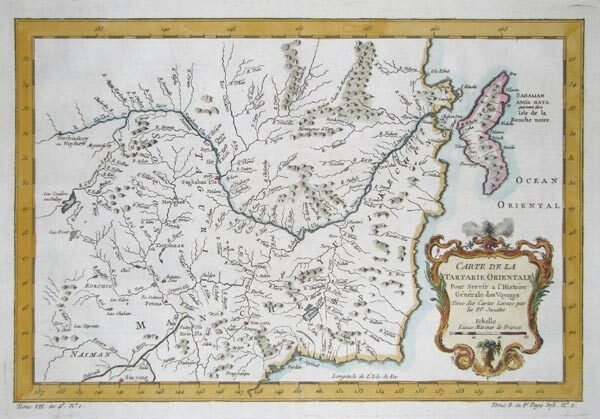 Published in the first atlas of the world on the same scale, so some of the more remote areas of the world such as this are shown in unprecedented detail. Amsterdam, c.1760. Early townplan, marking the layout of the streets, but only naming the Emperor's palace, a bridge and a suburb. Brussels, 1827. The environs of Tokyo, here called Jedo. A large French text describes the country. The map was published in the first atlas of the world on the same scale, so some of the more remote areas of the world such as this are shown in unprecedented detail. 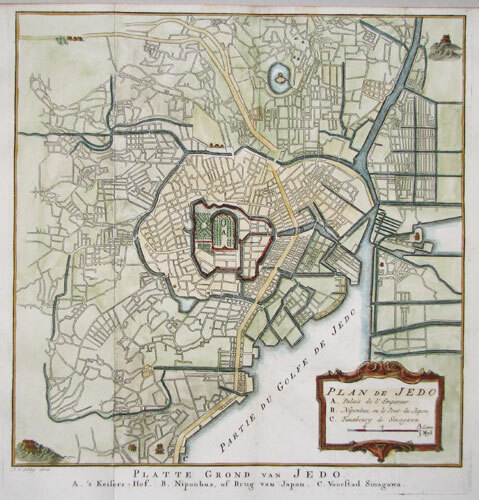 Paris, c.1760. Map of the island of Java, marking the various kingdoms and 'Jacatra aw Batavia' for Jakarta. Amsterdam, 1641. 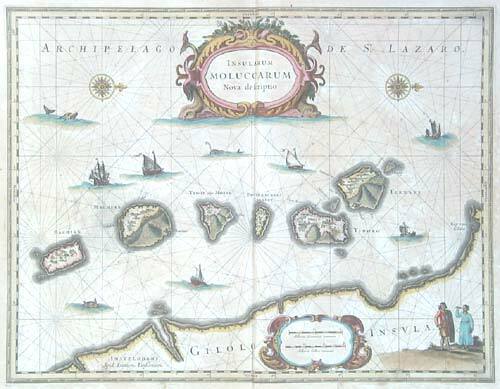 The Moluccas, marking the forts built by the Dutch to protect their traders. Amsterdam, c.1749. Mongolia, marking Peking and the southern tip of Lake Baykal. Amsterdam, c.1753. The western end of New Guinea map, with the islands of the Ceram Sea, including Misool & Boo. Paris, c.1775. 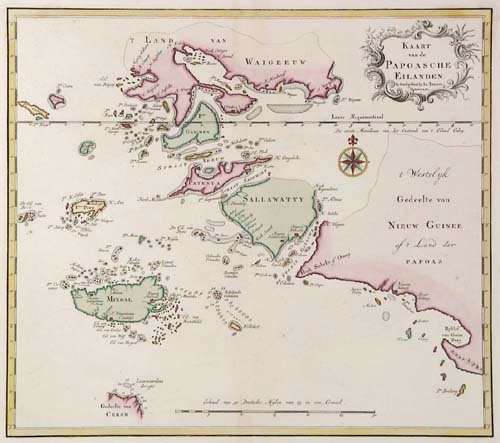 The routes of British explorers around New Guinea, 1699-1770, published in a French account of Cook's Voyages. Paris, 1683. Behind the couple are the nomads' tents. Frankfurt, c.1686. 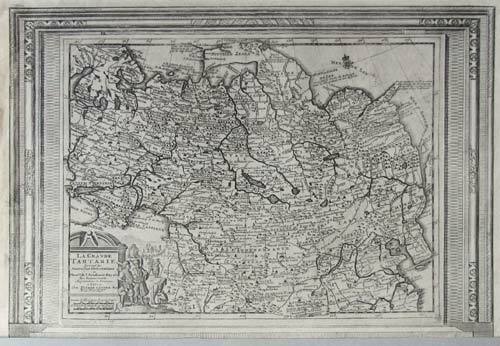 A German edition of Mallet's map of Siberia, showing Korea and part of Japan. Paris, c.1692. 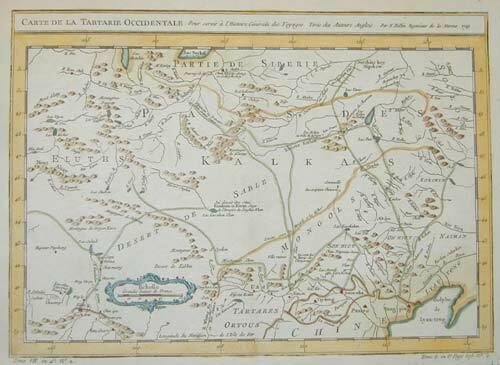 A map of Siberia and Tartary, engraved by A. de Winter for the quarto edition of Sanson's atlas. Korea is shown as an island. c.1711. Siberia and Tartary, with a title cartouche featuring a lion. Russia with a separately-printed frame border. Leiden, c.1710. Northern Asia from Moscow to Korea. Novaya Zembla is a peninsula, but attached to the mainland further east than usual. The decorative border has been printed from a separate plate for a special edition of the atlas. London, 1727. 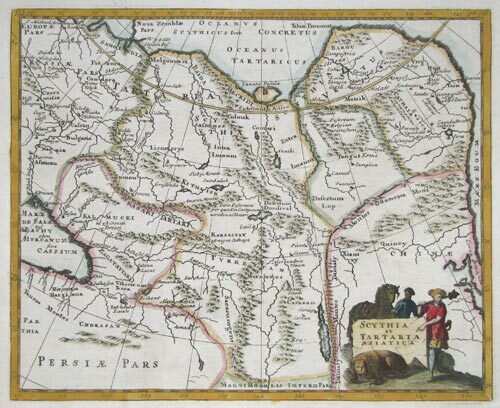 Map of Tartary to Peking. The eastern coastline of Asia is almost flat, with no attempt to mark Kamchatka. Amsterdam, c.1749. Eastern Tartary, showing the course of the River Amur and Sakhalin Island. Amsterdam, c.1749. The Kuriles, to the north of Japan, an archipelago once owned by Japan but since WWII controlled by Russia. 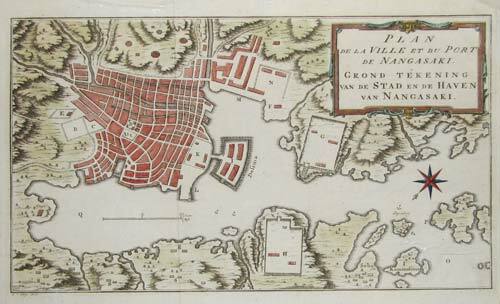 Amsterdam, c.1750. Northern Asia from the Caspian Sea to Kamchatka, which reaches down to almost touch Japan. To the east is the partial outline of 'Compagnie Land', the mythical island in the North Pacific. Paris, c.1764. 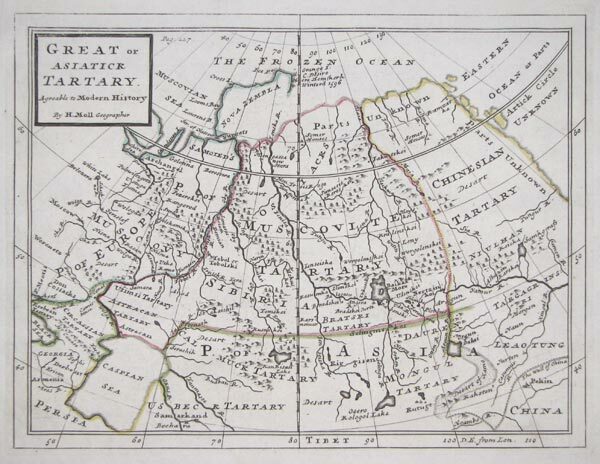 An early detailed map of the Kamchatka peninsula, based on the work of Stepan Petrovich Krasheninnikov, who travelled in the area 1737-41.